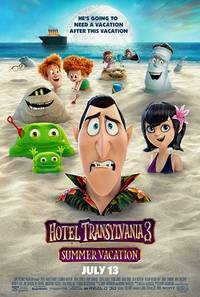 Love them or find them a little irritating, Hotel Transylvania is now very much part of the animated movie landscape, and for the most part – while I may not be part of the majority for saying this – these movies are surprisingly enjoyable. While any concept of Adam Sandler, Kevin James and David Spade voicing animated characters may stir up concerns that we may be receiving kid-friendly standards akin to the former’s Netflix output in recent years, this series has always been reliable for solid laughs and genuinely endearing characters. I’ll go into why I feel this series is so worthwhile a little further into this review – as well as why I feel this entry may be winding things down. The third instalment of the animated creature feature sees bloodsucker-turned-hotelier Count Dracula (Sandler) finding himself pining for another shot at love – and with daughter Mavis (Gomez) having arranged for her Dad and the regular crew of creatures and creeps to attend a unique ‘monster cruise’ so that he can take time away from running the business, the vampire finds himself falling head over heels for a human. However, this human is not what she appears – as an old adversary from Drac’s past rears his defiantly ugly head once again. Throw in reams of slapstick, sight gags and monster madness and you have one of the biggest family movies of the summer. Genndy Tartakovsky is an absolute marvel – his style of animation is so fluid and so effortlessly amusing in just a handful of facial expressions and movement of limbs – his work is what made the first two Hotel Transylvanias work so well in my opinion. It’s a crying shame that his plans for a Popeye feature film may have fallen through (though let’s leave those rumours regarding Sony having shelved it for The Emoji Movie to one side) – however, it’s always great to see his work up on the big screen. HT3 offers us all the characters, all the running gags and more besides that helped to bolster the first two movies. Kids are likely to get plenty out of this one – the gags come thick and fast, the pacing is speedy and the messages involved are valuable. 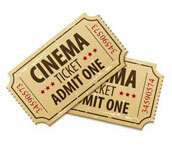 While not all of the laughs land – perhaps thanks to over-saturation of the movie’s trailer, which gave away much of the funnier moments – the undeniable charm is still very much alive and well, and fans of the first two movies, especially the younger crowd, will likely be more than happy with this latest instalment. However, it does rather feel now that HT as a franchise is reaching the natural end of its lifespan. With a family-friendly runtime and with so many characters – and with a storyline which, while predictable, can get a little twisty-turny for some younger viewers – it does feel like there are a few opportunities missed here which we’ll not be able to claim back. While the first two movies depended upon wry humour in a handful of facial expressions or an exaggerated movement or two (though the action was still frantic when it needed to be), everything in this edition moves at such breakneck speed that it’s hard to savour the jokes – in fact, it rather feels like a by-the-numbers joke machine at its absolute worst, though that isn’t very often. Essentially, while the charm is very much still here, what made the two preceding movies so funny seems to have been watered down a little – and what’s more, this instalment feels a little more like an afterthought. Also – perhaps the only major gripe I have here – is the fact that this time around, almost every character will mug the camera at some point. This may well have occurred sparingly in HT1 and 2, but this time – you’ll get a full face of ugly mug every few minutes – pun intended, it’s rather in-your-face! All things considered, however, we are discussing a movie aimed at family audiences – will it fare well with the target viewer? The answer is – very probably! Having waited for Incredibles 2 to peter out for a few weeks, a smart move was made in allowing audiences to breathe a little before throwing this up onto the big screen. Over-trailering has perhaps spoiled a little bit of the magic, but HT3 coasts on what remains a charming cast and a worthwhile message. While the humour from the first two movies may have devolved a little, it’s hard to keep up quality over three instalments – and while I may be in the critical minority in saying this, but I will always have plenty of time for Hotel Transylvania, whether 1, 2 or 3.